The following process flow chart provides a brief overview of the CFDA application process and the necessary steps. For a more detailed description of the application process for Chinese medical device registration, please read our free CFDA-booklet. Based on the risk class, different steps in the application process must be taken with different supporting documents being submitted. According to the Chinese regulations, re-certification must be done every 5 years. Application documents as well as all relevant supporting documentation must be provided. The manufacturer will need to classify their product into Class I, Class II or Class III, based on risk factors. All application and supporting documentation must be submitted to the CFDA. They will review application, supporting documents and classification and accept, reject or re-classify. The medical device will be tested by a CFDA approved test laboratory in China. Legal and technical supporting documentation may be requested. Clinical trials will be conducted (if required). 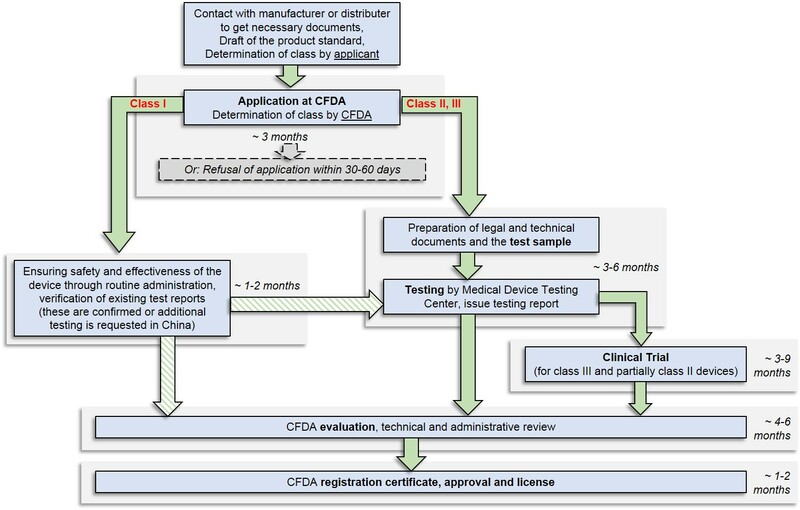 Evaluation of product test and/or clinical trial is done by the CFDA. Final results will be presented in a technical and administrative report. If the device is approved, a certificate of the registration and license will be issued. Please note that only after handing in all application documents will the CFDA decide whether a medical device registration is possible (usually within 30-60 days after application). There is the possibility that the application is rejected by CFDA, if this should happen an explanation and statement will be provided to the applicant. Expert CFDA Consultation from China Certification Corporation will reduce the time and expense when seeking CFDA registration for your medical device.